Bacon and Eggs in a Different Way | Low-Carb, So Simple! -- gluten-free, sugar-free recipes with 5 ingredients or less | Low-Carb, So Simple! Try to use as organic and natural products as possible. Try to find bacon without added nitrates and use organic eggs. The less processed food you eat, the better you feel. But let’s take a look how to make this dish. It’s simple. Take a small bowl, place the cream cheese and thyme in the bowl and mix well. Cover and set aside. Halve the eggs and remove the yolks carefully. Fill half of the egg whites with the cream cheese filling. Place the remaining halved egg whites on the filled ones and close tightly. Wrap all the eggs — again tightly — in bacon slices, using two slices per one filled egg. Prepare first the cream cheese filling: Combine the cream cheese and thyme in a small bowl and mix with a spoon until well mixed. Cover and set aside. Peel the eggs and cut them lengthwise with a sharp knife. Remove carefully the yolks and save them for another purpose (see the tip in the end of the post). Fill 6 egg white halves with the cream cheese filling. Cover with the remaining 6 egg white halves. Take 2 bacon slices per filled egg and wrap the eggs tightly in the bacon slices. Place the wrapped eggs on a shallow ceramic or glass baking dish and bake for 30 minutes. Even sometimes misunderstood, low-carbing is not just eating bacon and eggs but a healthy and versatile diet if done correctly. But just because you still can eat your bacon and eggs, it’s nice to get some twist to the dish. In fact, there was not much development and experimenting involved with this recipe, rather some ideas which I got like a bolt out of the blue. Last year, I just suddenly got the idea to wrap hard boiled eggs in bacon. Because just whole eggs in bacon would have been too lame, I got another idea to halve the eggs, remove the yolks and fill the egg whites with something delicious. But what could be something delicious which would suit the flavors of bacon and eggs? My first thoughts were melon balls, cherry tomatoes and seasoned cream cheese. I took six hard-cooked eggs, halved them, removed the yolks and filled two eggs with cantaloupe melon balls and two eggs with cherry tomatoes. The remaining two eggs I filled with a mixture of cream cheese and dried thyme. I took 12 slices of bacon and wrapped each filled egg tightly in the slices. I baked the eggs in 400 °F (200 °C) oven for 40 minutes. That was a bit too long baking time, actually. We tasted the result with my husband. Melon balls didn’t go that well with bacon and eggs about which I was quite surprised. Well, the combination of bacon and melon was okay, but melon and eggs were basically fighting in my mouth. So much for that. Cherry tomatoes — sweet ones — were really nice as filling. However, the cream cheese seasoned with thyme was our definite favorite. 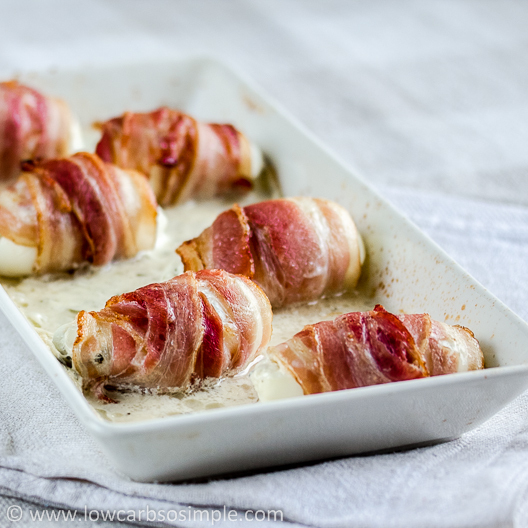 The cream cheese became fluid in the oven and it made a perfect, creamy and rich sauce for bacon and eggs. A year passed and I was making this recipe every now and then. A week ago I wanted to try out this dish again and see if there is still something to improve. Well, the amounts needed some fine-tuning but finally I was really happy with the result. Prunes belong to my favorite fillings. Prunes do contain some carbs, so you should be aware of that especially if you follow ketogenic diet. I use two prunes per egg, so the carb count will be 4.7 grams per one serving (= one filled egg). If you use cream cheese, the whole batch contains less carbs: 4.3 grams per batch. Cherry tomatoes are also great for filling the eggs. The sweeter the better. You can even wrap a cherry tomato in basil leaves and fill the egg with the whole thing before wrapping the egg in bacon. Tasty and beautiful. Use your imagination with the fillings. Take for example your favorite cheeses, fruits or veggies. If you use cream cheese you can season it as you wish. Good alternatives are crushed garlic cloves, chopped fresh basil, fresh or dried parsley, onion powder, garlic powder or garlic bread seasoning. Just use your favorite spices and seasonings. Chili, Tabasco or other hot pepper sauce is also great. You might wonder what to do with the cooked egg yolks. They are very nutritious so please at least don’t throw them away. A nice way to use the yolks is to make spread: Mash the yolks with fork. Add some mayonnaise or butter until you reach spreadable consistency. Season with a tiny amount of unsweetened mustard (like Dijon) or raw apple cider vinegar, a couple of drops liquid stevia, pinch of white pepper and pinch of unrefined sea salt. If you like garlic, you can crush one or two cloves and add them to the mixture. Mix well and serve with low-carb bread (or this bread) or crackers. Chopped chives are great for garnishing the spread and they give a fresh, piquant flavor. And if you really love bacon, why not having some Low-Carb Bacon and Candied Pecan Dark Chocolate Bark for dessert! This is my first time replying to a recipe because these were delicious! They were tricky to wrap since everything was slippery but tugging a bit on the bacon to wrap tight was the key. The smell from the oven was yummy!! I thawed a bag of spinach and mixed it with the cream cheese. Mine took exactly 32 minutes in a 400 degree oven . I put 2 eggs in small corning dishes with the leftover spinach mushrooms in my husbands dish …with a few sliced mushrooms. The eggs were also lovely enough for company! Oh… One trick in eating them, slice the opposite direction the bacon is wrapped! Thank you for a delicious …and pretty recipe! Couldn’t get 2 slices of bacon around my large eggs, 1 covered completely. Way too much cream cheese mix. So far they have baked 45 minutes, the bacon is not quite done. They smell yummy. I will try again this weekend. Your recipe sounds delicious, I will try it this week. I have to go shopping and will pick up bacon. I also want to try the egg stuffed with a meatball. When I make spaghetti sauce we always have our eggs with meatballs, we are Italian and that’s how our parents brought us up. Cannot wait to make your recipe!! Thank You!! Mayo might work, but it might also be too greasy and separate. Thanks for this recipe- can’t wait to try it! I haven’t tried this yet but I’m wondering why you remove the yokes??? Just for something different?? Hey, this recipe inspired me to make a variant of it. I used bologna instead of bacon because it’s what I had and added the egg yolks into the cheese mixture. I mentioned you on my website and I would love for you to check out my version of your recipe. Keep up the good work. Hi Tenesha, thanks for sharing your variation, I bet it tasted good! And it looked good, too, I just checked your website. You’ve done great work! Is this good for diabetic patients? Thank you, Antony! Yes, this recipe is perfect for diabetics, it doesn’t rise the blood sugar levels as long as you don’t go overboard with protein. All my other recipes are also meant for diabetics, but with those that contain sweeteners you should check what is the individual reaction, as different people react in different ways to sweeteners. Hi! That sounds like a great idea to make it in a bit different way this time. All recipes for deviled eggs seem to include the yolks in the filling, so why not use just cream cheese in the filling and use the yolks for some other purpose? Because the yolk is the best part! I will make these, though. They look delicious! I’ll just add the yolks. mmm… stuffed with sausage and cheese. Patricia, that’s a great idea to serve these on football Sunday! Hope you and your guys like them! What a creative idea! We are going away, but when I get home I am going to make these using Boursin cream cheese as the filling. I think that I will use the garlic flavour, but for Christmas morning breakfast I think these would be marvellous using their cranberry cream cheese. Apart from knowing without even tasting that these will be wonderful, I particularly appreciate the recipe because I usually have all the ingredients in my fridge. Kathy, thanks for your comment! Hope you like these if you try them out. I didn’t even think of cranberries and cream cheese, that sure is delicious with eggs and bacon!